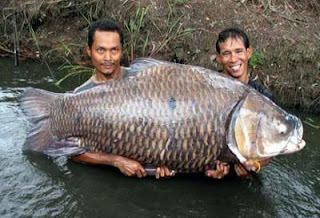 The world record for the biggest carp fishing was shot down recently, when a fish of this species about 120 pounds was found recently.Was need two people for the "beast" can be held for a photo. The fish was caught in Thailand by a fisherman known as Kik. "Kik present of an American tourist lake and took with him his own fishing rod. Planned to catch a sea devil to test high gear. But he managed his life performance, which other fishermen would give anything. It was very difficult to photograph. Fish was still kicking with his tail "